What Teens Can Learn from Ashton Kutcher: A Lot! Parents should take the time to listen to his acceptance speech and have their kids and especially teens listen. There are many lessons in it. Kudos to Ashton Kutcher for taking the time to influence our kids in a positive and REAL direction! Seeking residential help can be daunting online. Accredited Academics (Ask to see their accreditation): Education is important, some programs actually don’t offer it. Clinical (Credentialed therapists on staff): Please note–on staff. Enrichment Programs (Animal assisted programs, culinary, fine arts, sports etc): Enrichment Programs are crucial to your child’s program. They will help build self-esteem and stimulate them in a positive direction. Find a program with something your teen is passionate about or used to be passionate prior their path in a negative direction. My true nightmare was just beginning. Impressed by the fancy words and glossy brochures, I enrolled my child with the understanding that they were qualified to help. I am ashamed to say I never did a background check on these programs. I had called their parent references that they gave me (and later found out they were paid to talk to me, some actually receiving a free month’s tuition). I know many of you are thinking I must have been nuts, and you are right. In this stage of my life, I was at my wit’s end and just wanted help for my child. Long story short, my frenzy and desperation led to my biggest mistake. I was looking for therapy and internalization through the help of professionals, but what I inadvertently ended up with was more of a teen warehousing program. This was not what they had sold me. In retrospect, red flags went up shortly after I dropped my child off and I asked who the psychologist would be. Guess what? There was none, unless I wanted to pay extra! So who led the group therapy they raved about? There was no group therapy, there was a person, usually another student, who sat in a circle with them as they reflected. Their psychologist was available for another $100 per visit. But their sales reps had told me that there was a licensed therapist “on staff and on site.” I should have pulled my child then, but I thought I was over-reacting since I was in such a state of confusion and frenzy. The staff was very good at convincing me to “trust the program” instead of addressing my concerns. My child wrote me letters: some good, some bad. According to the program, the good ones were considered manipulation; the bad ones were considered proof that she needed to stay longer. I couldn’t win and neither could my child. During my child’s entire stay of almost six months, I was never allowed to speak with her. I only spoke with an employee once a week for 15 minutes (in further research, I discovered these employees had no credentials and many weren’t educated beyond High School, including the President of the organization). I later found out it usually takes up to six months to speak with your child, and in most cases up to a year to see them. It took me months to realize that I had made a big mistake. In order to visit my child it was mandatory to attend some very bizarre seminars; I wrote my withdrawal letter immediately after the second seminar. I brought my child home suffering from depression and nightmares from her time in a WWASPS program, and fear of being sent back had created suicidal thoughts. My child went immediately into real counseling where, after almost two years, an excellent psychologist helped us recover from this horrible, traumatic post-WWASP experience. When my child felt confident that I wouldn’t send her back, I heard some unspeakable stories. I have also heard similar stories from many other post-WWASP aka WWASPS students and families suffering from the same post traumatic symptoms. Through this experience I have developed the opinion that fraud and misrepresentation, combined with a vulnerable parent, can lead to danger for a child. I believe in sharing my knowledge of this (very political) industry with as many families as possible. As of March 2013, it is believed that WWASP aka WWASPS or Premier Educational Systems has affiliations with the following, click here. 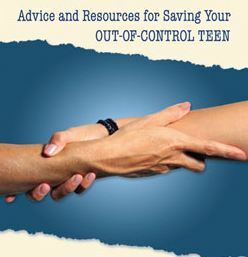 If you are one of the many parents struggling with their teenagers — good kids making bad choices — you are not alone. 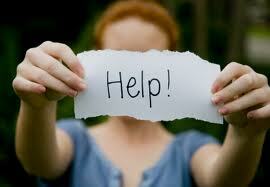 If you are in need of teen help, residential therapy is an excellent resource. In reality there are many more good programs than there are not so good; the key is to do your homework. I created a list of tips and questions to ask schools and programs before enrolling your child, as well as other valuable information. Be an educated parent and you will have safer and healthier teens. So ditch your denial and get proactive! Your child deserves a chance at a bright future. Learn from my mistakes, gain from my knowledge…..
Back to School: Is Your Teen Already Out of Control? We thought maybe a change of schools – maybe a new school year – maybe a fresh start – maybe a new maybe…..
Let’s face it, as parents we hope and pray that our teenager will grow out of that defiant behavior. This age of entitlement and spoiled rotten brat syndrome is getting worse by the day. The only refreshing thing is to know you are not alone! Though it doesn’t make it easier. One thing I can’t stress enough is parents can’t ignore the warning signs of a teen going down a negative road, especially if they are in their late teens. Remember once they turn 18 they are no longer in your control – though they may still be living with you, you can’t force them to get help. If your teen is 16 or 17 years old (especially 17+) and they are spiraling out of control, it is imperative you seek help for them. So many times, unfortunately, the once a week therapy session rarely is enough to make a difference at this point. Usually a teen has been through several therapist – and they won’t even attend. Don’t be a parent in denial – don’t think it is only marijuana – or it is only because of the friends he/she is hanging with – remember your teen is making the decision to smoke the pot and hang out with those friends. They are making these bad decisions. Learn more about getting your teen back on a positive road. Visit www.helpyourteens.com where we have helped thousands of families since 2001. There is no shame in admitting your teen is struggling. We have been there. Getting help is what responsible parents do. As I speak to parents on a weekly basis, I often hear how maybe if their teen spent some time behind bars they would appreciate what they have, or if they struggled through a rough primitive program, Wilderness program, militant style, boot camp or that type of model, they could scare their teen straight…. I explain to them if they thought about another approach – finding a a program that can actually determine where this negative behavior is stemming from? From there work through it and start building to make it into a positive road to a bright future. This recently released book almost seems to mirror what I have been thinking, though unfortunately, on a more extreme scale, these kids are incarcerated at a young age without a family that seems to truly care or without the means to get them outside help. 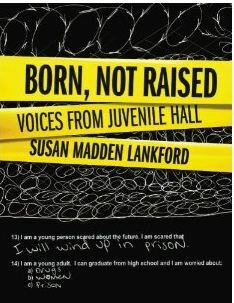 San Diego Author Susan Madden Lankford, who explored homelessness and female incarceration in her two previous award-winning books, examines the plight of youngsters serving time in juvenile hall in her latest book BORN, NOT RAISED: Voices From Juvenile Hall (Humane Exposures Publishing). For two years, Susan Lankford and her daughter Polly Smith interviewed more than 120 incarcerated teenagers, eight of them weekly. In this book she features their voices, views, writing and drawings—along with interviews with pediatric psychiatrists, neurobiologists, judges, probation officers and other professionals. In researching her previous book on women in jail, Lankford learned that a majority of them had at least two children in foster care, living with relatives or in detention. Because of the lack of basic parenting skills needed to produce productive individuals, many of their kids end up in jail, too. “In studying these teens for BORN, NOT RAISED, I learned the major factors that added to or reduced the likelihood of their incarceration and recidivism,” Lankford explains. “One of the main things which I stress in the book is that there is a critical need for a family with a good-enough, consistent, loving and nurturing figure who helps children through the developmental stages to produce a curious, empathic and responsible youth, capable of resilience, adjustment, impulse control and good social skills. “In this book I indict today’s educational system for its failure to respond to the needs of the global market and technology, as well as to the critical needs of students. I detail terrific programs which have discovered how to motivate kids who can’t meet classroom demands. Lankford believes that BORN, NOT RAISED contains information useful for university curricula, social work, psychology, criminal justice/corrections, medical school, law school, parents and parents-to-be. “In researching this book, Polly and I became convinced that early education and youth development are the most effective strategies for breaking the cycle of at-risk behavior and helping youth from difficult backgrounds to learn the skills that will enable them to thrive,” Lankford concludes. Watch a preview on YouTube. National Drug Facts Week is Monday, October 31st through Sunday, November 6th, 2011. Why do people and teens smoke when they know it is bad for them? Maybe they smoke because they can’t stop. People start smoking for different reasons,but most keep doing it because of one reason—they are addicted to nicotine. DID YOU KNOW? Research says that teens who see a lot of smoking in movies are more likely to start smoking themselves. Sometimes characters smoke to look edgy and rebellious; but sometimes it’s justabout “product placement” — the tobacco industry trying to get into your head and your pockets. FACT: More than 4 in 10 people who begin drinking before age 15 eventually become alcoholics. FACT: In 2007, prescription pain medications like Vicodin and OxyContin were involved in more overdose deaths than heroin and cocaine combined. Want to learn more FACTS about teens and substance use? 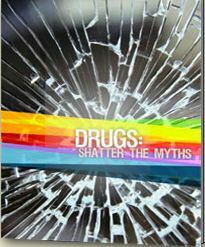 Download Shatter the Myths. Be an educated parent – you will have safer and healthier teens. Did you know: Children of parents who talk to their teens regularly about drugs are 42% less likely to use drugs than those who don’t, yet only a quarter of teens report having these conversations. SAMHSA invites you to participate in the 26th annual Red Ribbon Week. Red Ribbon Week—the oldest and largest drug prevention program in the Nation—is a way for people and communities to unite and take a visible stand against drugs. This year’s theme, “It’s Up to Me To Be Drug Free,” reminds us that we each share individual responsibility in creating a drug-free environment. It is an ideal way for people and communities to unite and take a visible stand against drugs. Show your personal commitment to a drug-free lifestyle through the symbol of the Red Ribbon, October 23 – 31st. The Red Ribbon Campaign was started when drug traffickers in Mexico City murdered DEA agent Kiki Camarena in 1985. This began the continuing tradition of displaying Red Ribbons as a symbol of intolerance towards the use of drugs. 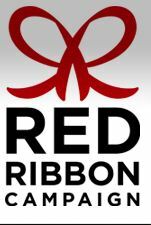 The mission of the Red Ribbon Campaign is to present a unified and visible commitment towards the creation of a DRUG-FREE AMERICA. The National Family Partnership is the national sponsor of the Red Ribbon Campaign. We are helping citizens across the state come together to keep children, families and communities safe, healthy and drug-free, through parent training, networking and sponsoring the National Red Ribbon Campaign. Plan a Red Ribbon celebration. Order and display Red Ribbon materials with the National Red Ribbon Theme. Proceeds from the sale of Red Ribbon theme merchandise helps support prevention programs across America. Order for your family, students, staff, patients, employees and customers and encourage them to wear the Red Ribbon symbol during Red Ribbon Week, October 23rd-31st. Sponsored by National Family Partnership.